What Can Weed Pro Do for You this Fall? We’ve been writing a lot lately about all the things you need to do to get your lawn ready for fall. From aerations to getting your equipment properly stored for the winter, there’s a lot to get done before the cold hits Ohio. But you don’t have to do it all alone! Weed Pro can help you get your lawn healthy and ready for the cold! Learn about what we have to offer! Core Aeration- After a long summer, the soil has probably become very compacted and the lawn roots could be cut off from receiving nutrients and water. An aeration can fix that! But aerating is no easy task, and if you don’t have the time to do it yourself, we can help! Weed Pro’s core aeration will relieve any compressed areas in your lawn and it dethatches your lawn in a safe manner. Overseeding- If you have bare spots in your lawn, you’re going to need to reseed. This may not be as difficult as an aeration, but if not done properly, grass won’t grow back in before the cold hits. You have to make sure that the seeds are able to get into the ground, germinate, and have enough time to grow. At Weed Pro, we can seed your lawn right after the aeration. The newly created holes in your lawn are great pathways for the seed to get down deep into the soil. Plus, they’ll be able to get better access to water, nutrients, and oxygen if the soil is not compacted. 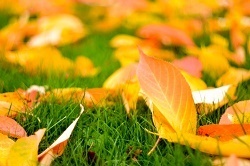 Lime- It’s very beneficial to lime your lawn in the fall as well. For anyone who isn’t familiar with this, lime is used to correct the pH balance of your lawn. If your lawn is yellow or not as green as it once was, the pH level could be the cause of the problem. Lime will work to bring back the nutrients and color to your lawn. If you are interested in learning more about these services or any others that we offer check out our website here. You can get a FREE estimate now! Just click below to get your FREE estimate today!